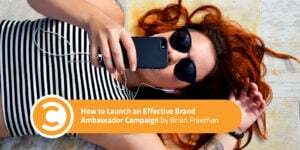 Brian Freeman is the CEO and founder of Heartbeat, the first platform for ambassador-powered marketing at scale. Heartbeat has more than 140,000 on-demand female brand ambassadors for launching turnkey ambassador solutions. Its mission is to empower real women by giving them a voice in marketing and paying them for the power of their collective authentic voice. Heartbeat has done campaigns with Amazon, Laura Mercier, Saks Fifth Avenue, Warner Brothers, Netflix, and other big brands.